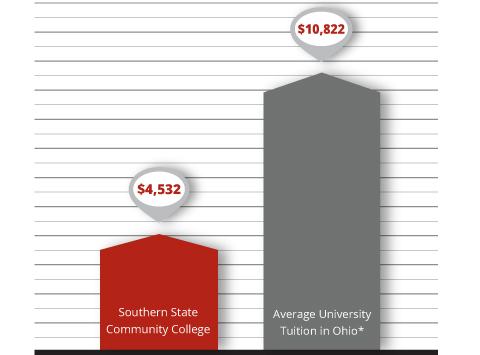 Tuition at Southern State is among the lowest of all two-year colleges in Ohio, not to mention all four-year colleges. Matter of fact, you can expect to pay less than half of the average tuition among Ohio’s four-year colleges. In addition to the extremely competitive tuition, Southern State also prides itself on CONNECTing you with financial resources. The Office of Financial Aid is the best around—we know this, our students repeat it over and over. If you haven’t already explored what might be available to help you pay for college, here are some great places to start! Use this tool to estimate your total cost at Southern State!